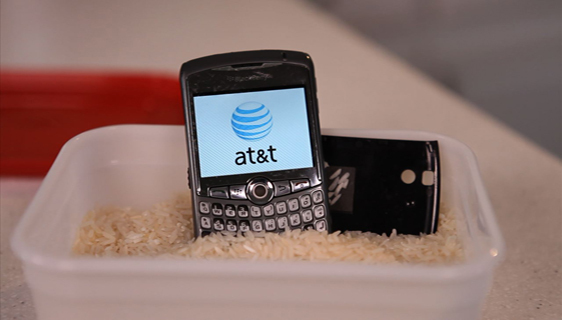 Did you just drop your cellphone in water? Or maybe you'd like to know what to do if that happens! This week on Upgrade Your Life, Yahoo! News' Becky Worley shows us first aid techniques for rescuing a drowned smartphone. Why do water and smartphones not mix? Because the water shorts out your smartphone's electrical circuits. So whatever you do, don't turn it on to check to see if it still works. You want to remove anything removeable: Pull out the battery, the SIM card and the memory card, if your phone has one. As long as that battery's in there it's providing power to your phone, and that's what you need to stop immediately. Some phones, like the iPhone, don't have a removable battery. Unfortunately, you'll just have to skip this step and hope for the best if you dunk one of them. Did you drop your phone in salt water? The salt can corrode your device. So after you pull out the battery and SIM card, immerse your phone in fresh water to rinse out the salt. If you have a compressed air can handy -- the kind that's used to clean computers or keyboards -- run it full-blast all over your phone, with the back cover taken off if you can. A vacuum cleaner also works, even though it's pulling the air in the other direction. As long as it's blowing cool air over those circuits to dry them out, it's all good. Don't stick your phone in the oven, even on low. The heat can warp your phone's circuits, and melt its internal components. You shouldn't use a blow dryer either, unless it has a heatless setting. A fan might help, but a microwave is out of the question. The premise of our experiment was to test if putting a wet phone into a sealed container of rice would actually dry it out, and bring it back form the dead. See, the idea behind the rice is that the dry grains will absorb moisture. So get a sealable plastic container, and fill it with enough rice to cover your smartphone. (A plastic zipper bag will work too, in a pinch.) Then bury your phone in the rice, along with its battery and other parts. You'll want to wait at least 24 hours for the rice to do its job -- Becky waited for 48 hours, in her test. What would work better than rice? Silica gel, the stuff in those packets that keep new clothes or shoes dry. But most of us don't have a shoebox full of the stuff laying around, so rice will probably have to do. It may get pieces of rice into the crevices and cavities in your smartphone, but this is an emergency, and time is of the essence. Should you use white or brown rice? It doesn't matter, so long as it's hard and dry and uncooked. You can even use rice from boxed meals like Rice-a-Roni. Just don't add in the seasoning packet, unless you want your phone to smell like mixed vegetables. After you've waited at least 24 hours, it's time for the moment of truth. Reassemble your phone, charge it and try to power it on. The results of our experiment weren't encouraging: the BlackBerry that Becky tested did restart, with no seeming long-term damage. But the iPhone and the Droid were dead. After two days in the rice and a full battery charge, neither phone came back to life. One in three may be slim odds. But since water damage isn't covered by most warranties, it can't hurt to try.